I have learned to love these sweet morsels. I know the color is odd, I know that the shapes are a bit strange but..if you bake these beauties until the outside skin is crispy, break them open, add a good dollop of sweet butter and a bit of cinnamon, you will be in heaven. I love eating the crispy outside almost as much as the silky sweet inside. They really don’t look to pretty when you make them in a casserole, I have tried it several times and it turns a very strange almost dark purple color. Not very eye appealing so I am now just baking them and enjoying them that way. The locals call them camote, I call them fabulous! 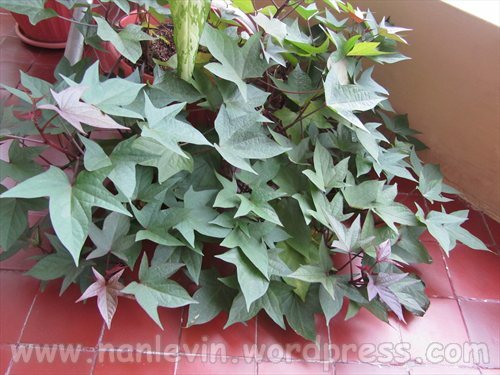 The above photo is a camote plant that I have planted on my balcony. Yes, you guessed it. I allowed my sweet potato to sprout and because it was such a beautiful green/purple plant I could not just throw it out so I found a spot in one of my pots and planted it. It is a beautiful flowing vine and loves being on our balcony. Next I will need to see if any sweet potatoes are actually forming…and then you can call me Farmer Nancy. 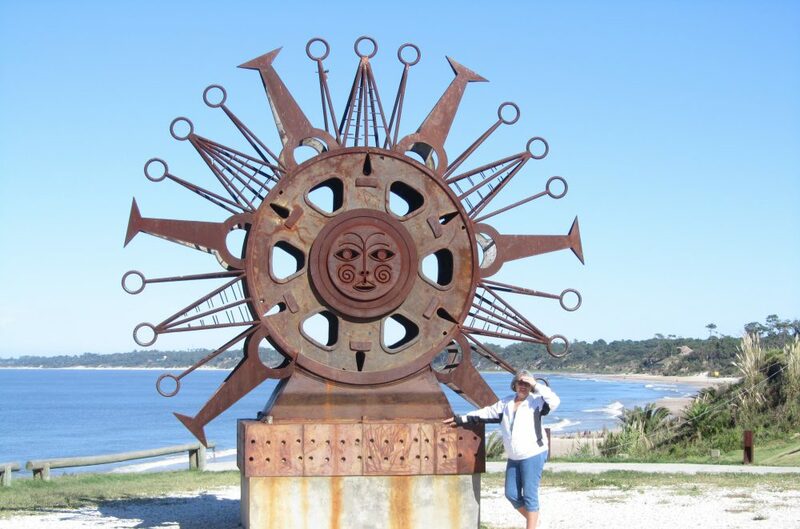 This entry was posted in Ecuador, Food, Salinas, Salinas, Ecuador, Santa Elena and tagged Beach living, Ecuador, Expats, Retired, Salinas, Santa Elena, South American by Nancy Levin. Bookmark the permalink. Farmer Nancy, I was just looking up a recipe for sweet potato pie. A friend of ours smuggled a sweet potato in her luggage for us. We planted them several months ago and Ron just harvested about a 5 lb. bucket of sweet potatoes. They really grow well here and no one has seen anything like them. I’ve never seen the Ecuadorian sweet potatoes. They are beautiful. What color are they inside? Deb they are almost purple – it is the strangest thing. I am envious of your orange sweet potatoes, we can get those once in a while here but it seems these Comote type are more common. Like I said to make a sweet potato casserole it turns out a really ugly color not very appealing. Thanjs Nancy- I did microwaved them couple of times but they turned out dry so baking is ideal I suppose- do you wrap them in foil and bake them in regular oven?is it camate or comate? Camote is low in glycemic index and very rich in vitamins A and C. It has anti-inflammatory and blood sugar regulating nutrients. Instead of the plain potato, which is easily converted into sugar, use this one and you will get a lot of beta carotene, manganese, potassium and other minerals. The leaves of camote is actually edible and very nutritious too. Farmer Nancy, this is a beautiful plant!!! I am off to the Coopera to see if they have it, if not I am off to Feria Libre to see what they have there.. We have been looking for a new type of potato to bake.. this will be fun… and I am going to grow one too! That is beautiful! I’m so glad I found your blog. Recently moved here about two years ago with my fiance and daughter (he is Ecuadorian/American). I miss sweet potatoes so so much! 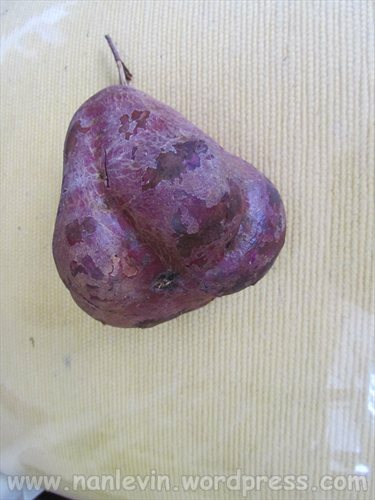 I live in Quito, can you find them in any farmer’s market, or only in certain places in Ecuador? Please let me know, I’m itching to get my hands on them again! Hi! I live in Quito too. How long do you cook them? I baked mine and they were really starchy. Hi Nancy, I moved to Ecuador from the US 3 years ago, and now live in Guayaquil. I’m quite impressed with your blog! Your discussion of camote was “spot on” right now, as I’m preparing (with my Ecuadorian wife) to host a Thanksgiving feast for my in-laws. I’m in the hunt for some nice orange sweet potatoes! Meanwhile, I plan to experiment with the “camote morado”.